After you search for an item, you can tap the profit number (1) to display the profit calculation screen. 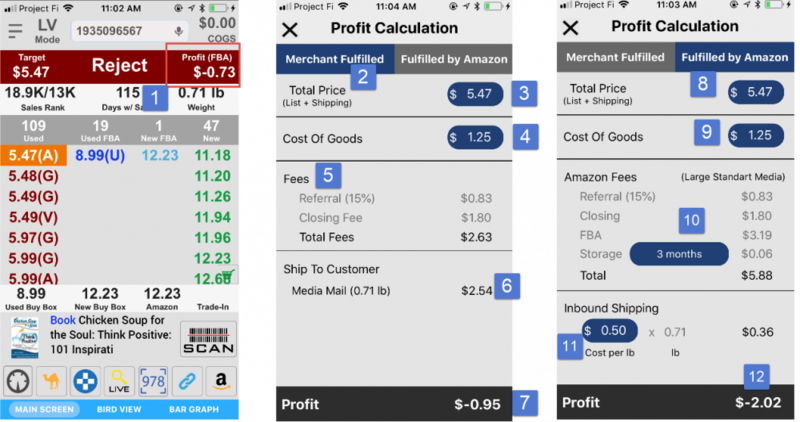 Tap “Merchant Fulfilled” (2) to see the profit if you were to ship the item yourself. You can adjust the price (3) you plan to list. Tap (4) to enter a different purchase price (COGS). Amazon fees are listed in (5). We use Media Mail rate to calculate the estimate shipping cost (6) when you ship to the customer. The weight information is obtained from Amazon. Tap “Fulfilled by Amazon” to see the profit if you were to have Amazon store and ship the item for you. You can adjust the price (8) you plan to list. Tap (9) to enter a different purchase price (COGS). Amazon fees for FBA are listed in (10). Our app will estimate how long this item will stay in the Amazon warehouse before it gets sold and uses this information to calculate the “Storage” fee. You can overwrite this to manually select a certain number of months. Since Amazon introduced a steep Long-Term Storage Fee (LTSF), it is recommended you choose 12 months or longer to see if the LTSF will impact your profit.